Gantry Sealers | PAK Automation Ltd.
PAK Automation Gantry Sealers are custom built based on the requirements of the customer. PAK Automation have manufactured a variety of gantry sealers for a wide range of applications including the manufacture of liners for tankers and freight, mattresses and medical applications. 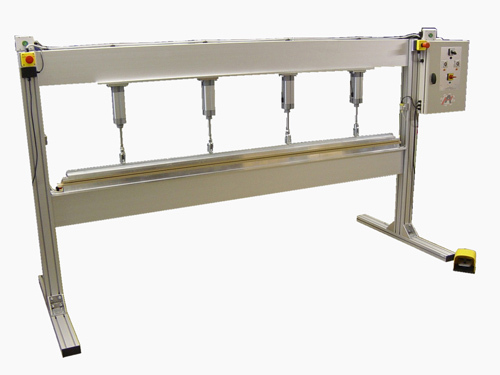 Our gantry sealers are pneumatically operated and designed to produce large shaped welds or long straight seals. They can be utilised on a number of materials including laminates, polythene and non-woven coated materials. An integrated two-stage pressure circuit provides enhanced safety and the rugged construction ensures a long production life. Multi Range Adjustable timers fitted as standard allow precision control of the weld and cool cycles of the gantry sealer. Programmable Logic Controllers enhance seal quality, producing a perfect seal each time the gantry sealer is used. This is achieved by accurately controlling the element ribbon temperature and seal time. PAK Automation’s gantry sealers also come with a built in batch counter and preheat setting providing added efficiency and time saving benefits.